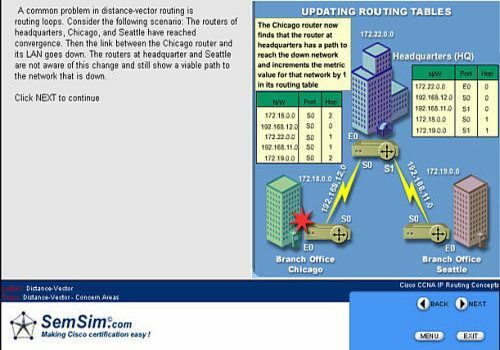 SemSim CCNA 640-802 Training : Online Cisco CCNA 640-802 Certification Exam Training is an online course that teaches you using sound, graphics, interactive simulations and assessments. Updated to reflect the latest exam trend: 640-802, ICND1, ICND2. This Cisco CCNA 640-802 Certification Exam training is the first top-quality, low-price online CCNA course in the market. SemSim Cisco CCNA 640-802 Training Course is your own personal trainer.